When it comes to creating a model railroad, what you do on your layout after it’s complete is equally as important as before. Regularly scheduled maintenance helps ensure that your hard work in the design, planning and construction stages pay off, and that your operations continue to run smoothly. Model railroad maintenance requires more than simply dusting your structures and upgrading a paint job; it also means keeping your tracks clear and making sure all rail components remain in peak condition. And learning how to clean model train tracks, wheels and other elements isn’t a difficult process, so there’s no excuse not to make it a part of your routine. There are, however, various ways of getting the same job done, and it tends to be a matter of preference. In this lesson, master modeler Chuck Hitchcock teaches you how to clean model train tracks with the method he prefers to utilize on his HO scale model Argentine Division of Santa Fe Railway. 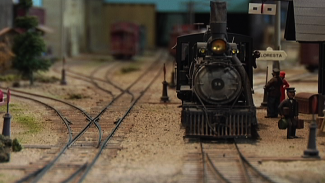 Chuck’s layout of the passenger and industrial train system that weaves its way through Kansas City and surrounding regions is a sight to behold, but it doesn’t stay that way without a little bit of upkeep and cleaning. 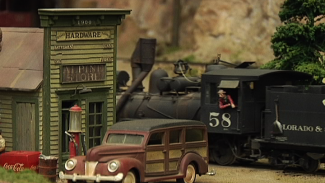 To demonstrate how an expert maintains the pristine look and operation of his model railroad, Chuck shows you how to clean model train tracks and wheels using only a small amount of lube. 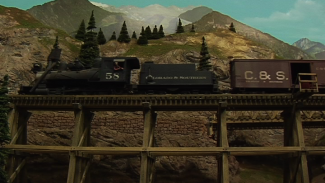 It’s been a common misconception that Chuck’s method of how to clean model train tracks and wheel components is to lubricate every inch of the rails, but he dispels this rumor and talks about the way he actually likes to use a simple non-petroleum product to touch up the rails and wheels on his railroad every couple years. As a bonus, he teaches you the proper way to take care of the engines on your railroad by using cards to notate when they’ve been inspected, cleaned and lubed. Use Chuck’s method for learning how to clean model train tracks and wheels, and we guarantee you’ll make the cleaning process much easier!